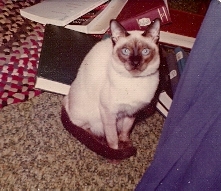 I had just lost Sita, my sealpoint Siamese girl cat, after sixteen years. Sita was very smart and pretty, but she had a streak of the jungle in her genes. 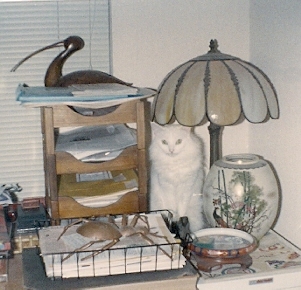 After Sita died, we still had Ara, a handsome turquoise-eyed flamepoint Siamese. A sweet guy, but like most male cats, he was aloof. I longed for that maternal girl-cat connection. The local SPCA’s Cat of the Week featured a long-haired, mostly white female cat named Cottonball. We jumped in the car to go see her. When I walked into the Cat Habitat, my eyes connected with the absinthe eyes of another girl-cat entirely. Pet-baby love at first sight! 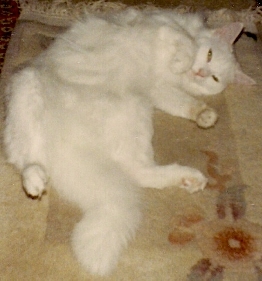 Her long, silky fur was purest white with no spot of any other color. A ruff encircled her throat and spilled down her chest like Elizabethan lace. Her tail could have passed for a plume on the fancy hat of a countess. Those absinthe eyes were almond-shaped, the nose aristocratic with pink nose leather. Overlong whiskers arched around the pink bow of her mouth. 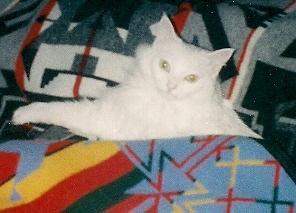 Like Luna, she was a purebred left in the pound: a Turkish Angora. The kind of cat cat breeders want a thousand dollars for. She was also nearly starving to death, refusing to eat the cat food the pound gave her. She was terrified and traumatized when we rescued her. Whoever put her in the pound had named her “Salt.” We changed that right away to Alana, which means “darling” in Gaelic. The adoption card said she was two years old. Unlike Luna, that turned out to be true. Since she refused to eat Fancy Feast or any other canned cat food, I baked fresh ground turkey for her. With homemade food, supplemented by the best cat kibbles providing taurine and other vital feline nutrients, Alana regained her strength to become the most brilliant and beloved of all my cats. She invented her own toys, pulling a plastic safety seal off of a milk bottle out of the trash, pressing her toes on the edge of it, flipping it onto her wrist, and high into the air. Then she juggled and chased it across the living room. She was so expressive with her paws, I called her my conjuring cat. She opened a ten-foot-high sliding closet door with her forehead, snuck inside, and shredded a nest out of a box of old letters. She staked out places on tables in my two offices, working with me every single day. She followed me everywhere. She gazed at herself in the mirror. One day I was in the lavatory, putting on my contact lenses, when she rushed in and jumped on my back, pawing my shoulders, thrusting her face in my hair, giving grooming bites on my ears. When Tom heard me giggling and shrieking, he rushed in, and she meowed at him in a peculiar fierce little voice that said, “She’s mine.” She did this trick whenever she was in the mood; I would bend over the sink to encourage her. And yes, call me a kooky cat person, but she actually spoke words (Tom heard them, too). She would walk out of the kitchen after a freshly cooked meal and say, “Yum, yum, yum!" Alana lived with us for sixteen wonderful years, which means that when she died, she was probably eighteen years old—in a breed not known for longevity. Like her best friend Luna, I immortalized her as one of Ruby A. Maverick’s cats in Summer of Love. and Abby Teller's MagiCat in The Garden of Abracadabra. Like Luna, Alana will live forever and ever in my books and in my heart. About Water: The number one health problem for cats is kidney disease. Felines notoriously do not drink enough water. To make matters worse, cat kibbles (the dry stuff) contain “ash.” Ash is animal byproducts unfit for human consumption (think skin and bones). I’m not sure if they actually burn the stuff (I suspect they do). Then pet food manufacturers put it in cat kibbles because it’s cheap and edible. Years ago, pet food manufacturers put so much ash in cat kibbles that the food was causing widespread kidney failure in cats. I know, because my first pet baby, Rama, a Sealpoint Siamese, nearly died from it. Now pet food manufacturers cannot legally dump a bunch of ash in cat kibbles. You’ll notice on the labels “contains no more than a certain percentage of ash.” Buy only kibbles with the least amount of ash. 2017 Note: We don't feed Athena kibbles, at all. She eats freshly baked ground turkey thigh and Whole Paws canned food, the turkey flavor and the white fish and chicken flavor. These canned meats have no meat by-products or grains or blood meal, plus all the necessary vitamins and taurine. Highly recommended. So that’s the first step. Now comes the Water itself. I read in a British cat care book that cats, with their keen olfactory sense, dislike tap water because they can smell the chlorine. If you can afford it, buy bottled spring water for your cats. I observed that Alana and Luna drank much more spring water than tap (and where we live, our tap water is some of the best in the country). Next, we placed water bowls in four different locations to encourage them to take a sip wherever they roamed. And we made sure to empty the bowls, scrub them out so no slime or bacteria lurked at the bottom, and refill with fresh spring water every day. It’s a lot of work, I know, but your kitty is worth it! We do the same for Athena. Fresh spring water every day! "Every feline is a masterpeice." Leonardo Da Vinci.